La Bloga: Portrait of the Artists. LibroMobile Needs A Crowd. Portrait of the Artists. LibroMobile Needs A Crowd. It’s my version of Las Meninas. 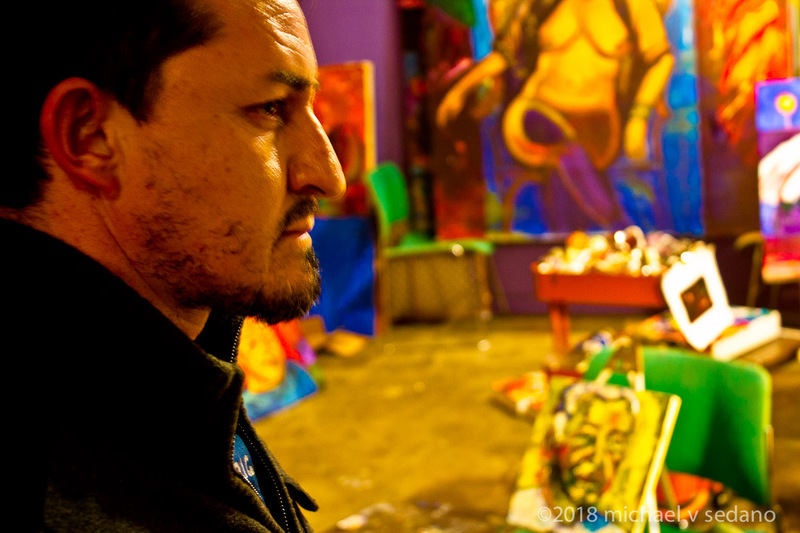 That is, a foto of what the subject sees looking back at the painter, at others in the space, at the studio ambiente. In my case, it’s the view from a couch in a nondescript building next to a llantero on Figueroa street in Highland Park. 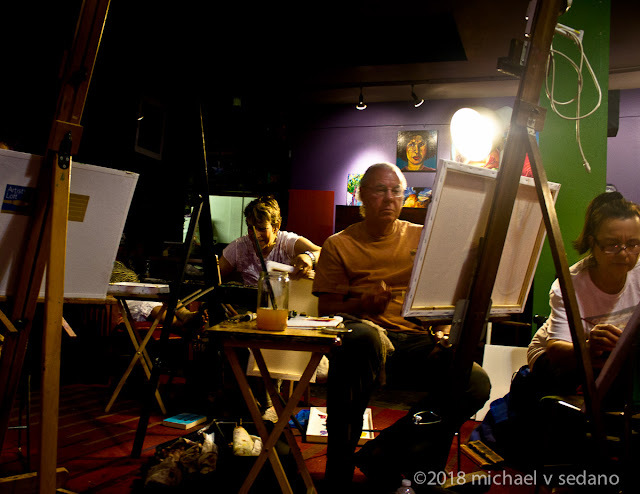 It is Monday night and my wife and I are sitting for Margaret Garcia’s portrait painting class. It will be the first of two sittings. 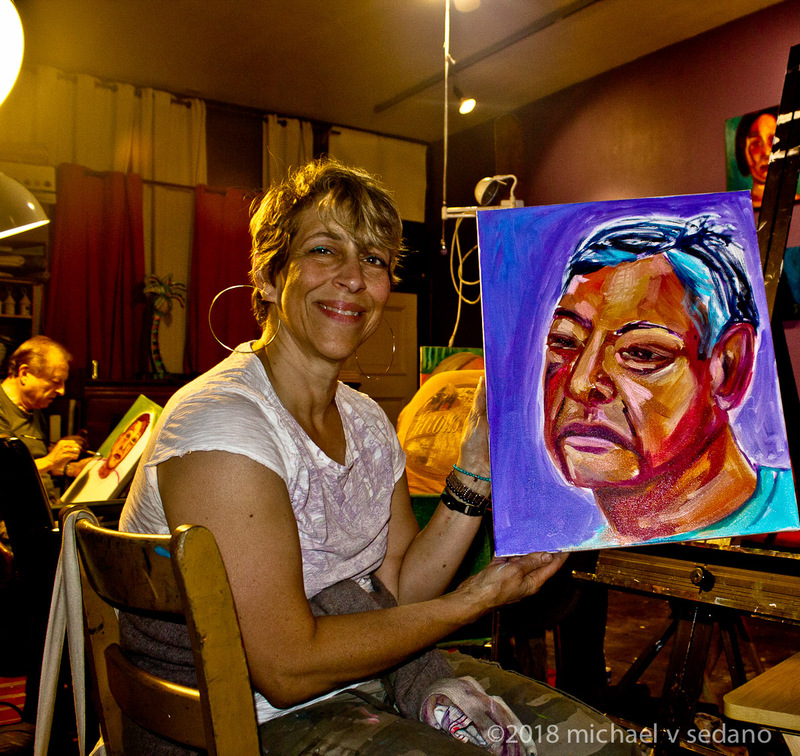 My wife and I look forward to celebrating our fiftieth wedding anniversary in August, and in the back of my mind I hope I like one of the portraits and we can buy it for our mutual anniversary present. My wife fell ill and couldn’t sit for the second class. Garcia’s students didn’t get second sitting to work on the pair of us, so no anniversary gift yet. The artists have spotted their easels in a semi-circle around the couch. Some get profiles, other full face. Behind the circle of easels, bright floodlights on tall stanchions illuminate their canvas and the couch. “Find a spot and focus on it.” Pose like that, focus for two hours, and a break if we want. Not that we have to be frozen in place, but the artists need us to hold that focus as much as possible. At one point an artist wants to talk and I grow animated. Garcia puts the kibosh on conversation. Hold that focus. For the photographer holding a pose, taking a foto is a matter of point, shoot. I steady the camera with one hand on a cushion or knee. These will be long exposures, between 2 seconds at f/22 and 1/30 at f/3.5. I point the axis of the lens parallel to the floor then tilt up a few degrees. With the lens racked to its widest angle, I trust to getting it approximately right. Several frames produce a las meninas moment. The artists intent on framing me, the camera catching the moment dramatically illuminated by blinding floodlights. 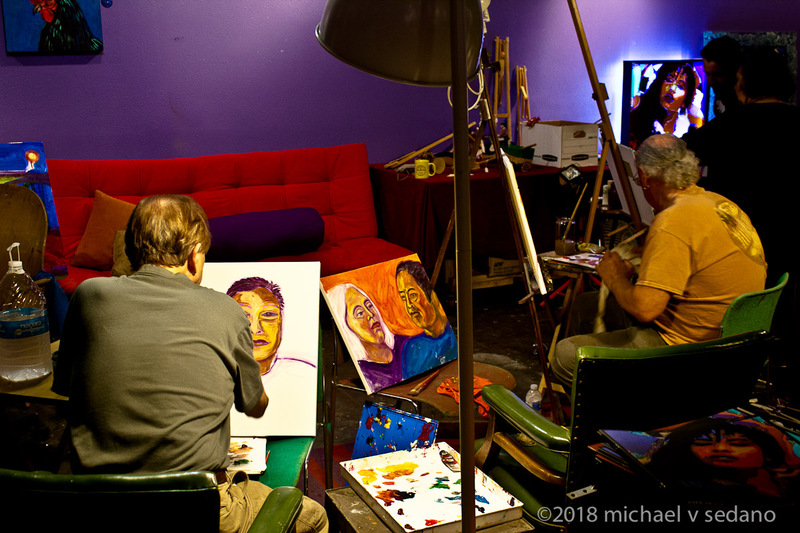 After the sitting, the artists do finish work on their portraits and happily display their portrait. One asks me how I feel, seeing these representations that are supposed to be me. The images are not me. 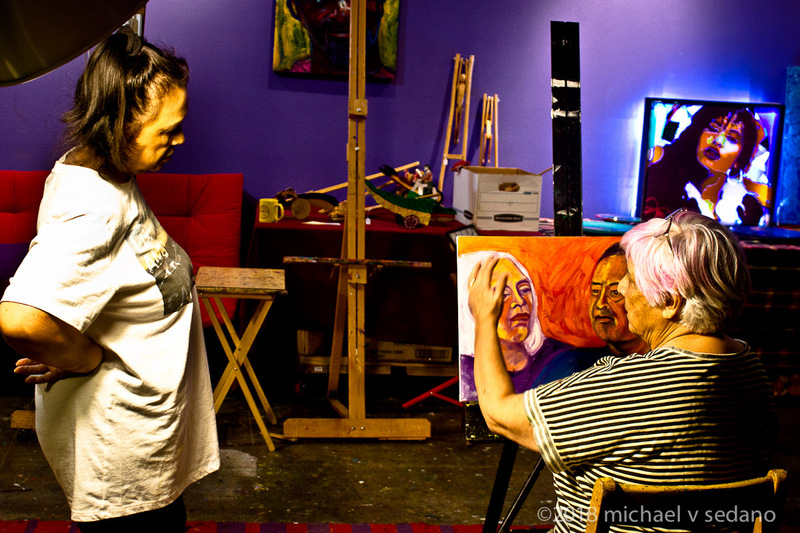 The artist’s representation of what she saw, he saw has been laid down on canvas conditioned by perception and intent, produced as a result of the artist’s available time, inherent skill, learned technique, and execution. Each portrait represents itself, that fellow in the painting. I wonder what he’s thinking? Margaret Garcia's colorist style sets the standard for the class. Garcia paints for herself during the workshop--never let a sitting go to waste--and also works with individuals to solve particular issues. 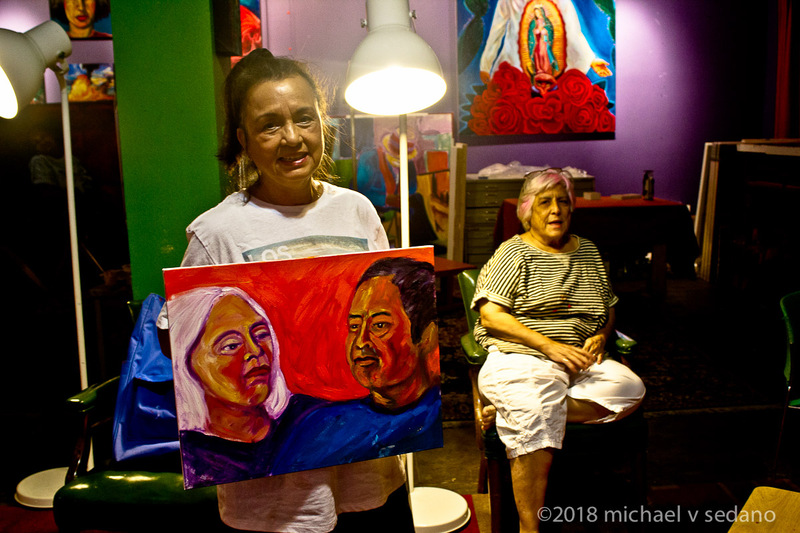 When Barbara gets back on her feet again, we’ll return to Margaret Garcia’s portrait class and see if our sitting can generate a perfect fifty year anniversary portrait. A ver. No one can accuse Sarah Rafael García of doing well by doing good. She’s not raking in the long green from her peripatetic book selling enterprise in Santa Ana, California, LibroMobile. But she’s doing good, matching literary gems with gente who need to read them, and giving or selling books that gente want to read. We have partnered with the ‘Friends of the Santa Ana Public Library’ to sell used books at a lower price and set up Little Free Libraries throughout Santa Ana! We’ll also be visiting Café Calacas on occasion and serve their café de olla at our special events! 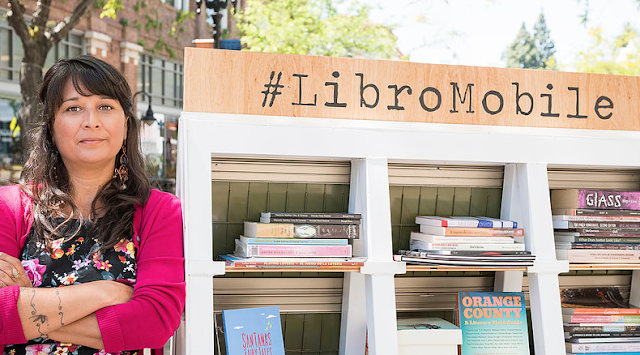 LibroMobile, is raising funds via a rewards crowdfunding campaign on Indiegogo https://igg.me/at/librosforsantaana to raise $4,000 to purchase 400 contemporary Spanish books by May 18th. At present, the selection of books in Spanish is limited, which makes it impossible to meet the demand of their Latinx community in search of literature in their native language. The indie bookstore relies on donations of new and gently used books, but Spanish books are the least donated by LibroMobile’s supporters which are typically more expensive than English books. In efforts to support Latinx presses and Spanish language publishers, all funds from the campaign will go to purchasing Spanish books directly from Spanish language publishers that carry contemporary authors.